The new Poly-Tube provide drip hose users a dependable and safe method of installing drip hose in above and below ground applications. Dependable, because the rugged, yet simple design guarantees uniform performance under a wide variety of operating conditions, and safe, because the unique design allows use of any manufacturers drip hose with a minimal amount of adjustment. The heavy-duty side flanges easily adjust to any manufacturers hose. All exposed metal components are zinc plated to resist corrosion. Precision bearings in the carrier assembly insure long life, and a tensioning system on the carrier shaft provides gentle tension to prevent overrun at the end of the row. The carrier mounts to any toolbar using standard clamps. A speed control allows the operator to control tension and speed of retrieval. Reel rotates and locks in multiple positions to allow hose to be dispensed or retrieved at any angle. Excellent for orchard applications where hose is injected under the trees’ low hanging branches. These industry standard TWD Carriers will hold up to 1500’ of material. Equipped with adjustable over-run protection, this units allows quick change-out and bidirectional release of material. These industry standard TWD Carriers will hold up to 1500’ of material. Equipped with adjustable over-run protection, this units allows quick change-out and bidirectional release of material. This unit is equipped with a mechanic fold away feature that promotes ergonomic handling of material. 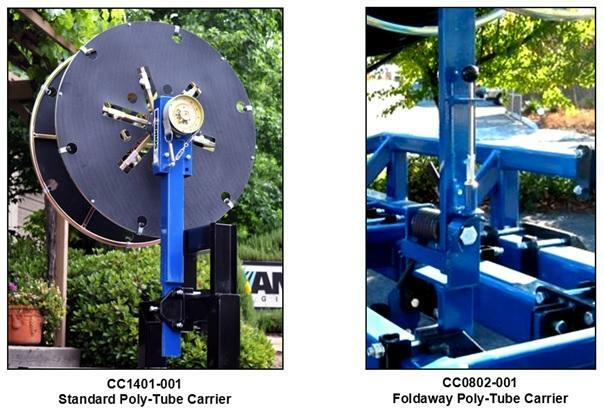 Our Poly-Tube Carriers, whether for layout or retrieval, are the industry standard with hundreds in use across the country. Contact your local Andros dealer to find out how you can use these, and the entire Andros line of drip irrigation tools to maximize the efficiency of your drip irrigation system.